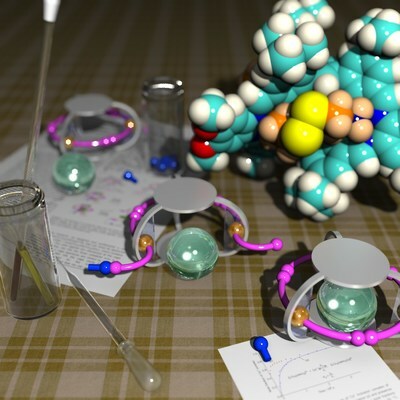 Researchers at Kanazawa University and University of Tsukuba report in Chemistry - A European Journal the synthesis of a closed molecular cage with areas that can be opened. The opening is achieved through chemical reactions that break the molecular units acting as closures. Molecular cages offer the possibility to encapsulate ions or other molecules. If the cage structure has a 'hatch' that can be opened or closed in a controllable way, it can operate as a molecular gate. 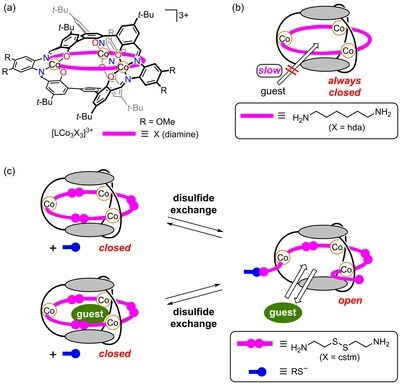 Now, Shigehisa Akine from Kanazawa University and coworkers have designed a new type of molecular cage with a hatch that opens through a particular chemical reaction: disulfide exchange. The structure synthesized by the researchers is a metallomolecular cage, involving three cobalt ions linked by three cystamine ligands. (Cystamine is an organic disulfide: the molecule features two bound sulfur atoms to each of which an ethylamine group is attached.) In its as-synthesized configuration, the cage is closed. Experimental and computational studies of the cage structure showed that the cystamine ligands close off areas that would otherwise be apertures. The researchers therefore speculated that reactions with thiolate anions would open up these 'blocked' apertures, since disulfide-thiolate anion reactions are known to cleave disulfide bonds, and hence break the cystamines into two parts. In order to test the hypothesis that reactions with thiolate anions can convert the initially closed cage into an open one, Akine and coworkers investigated the uptake of cesium ions (Cs[+]), as these would indeed fit in the opened cage. The scientists first exposed the molecules to cesium ions in the absence of thiolate ions and monitored subsequent structural changes by means of nuclear magnetic resonance (NMR) spectroscopy. After about 14 hours, a 50% uptake of Cs[+] had happened. Then, the same procedure was carried out with thiolate ions present. Already after 1 hour, a 50% Cs[+] uptake was observed. The NMR signal for the open cage, however, was not observed, suggesting that only a small fraction of the molecules had opened up. Additional measurements confirmed that the cesium ion gets indeed encapsulated in the closed cage, and that the thiolate anion, and not an amine also present in the mix, causes the uptake of Cs[+]. Akine and coworkers conclude that "the concept of the metallomolecular cage with open/close functions is believed to be useful to construct molecular containers in which a specific guest can be entrapped or released upon external stimulus, and the on-demand guest uptake/release systems would be applied to new functional systems with a unique responsive behavior." Thiolates (also known as mercaptides) are salts consisting of a countercation and a thiolate anion, which in turn consists of sulfur attached to an organic rest. Thiolate anions react with disulfides (two bound sulfur atoms), breaking the S-S bond. Shigehisa Akine from Kanazawa University and coworkers have now used this chemical reaction to open up an originally closed, caged-like molecule. They were able to first synthesize cage-like molecules with 3 cystamine ligands closing off 'holes' in the molecules. Cystamines are symmetric molecules with a disulfide at its centre. Reactions with thiolate anions break the cystamines into two parts, which leads to the cage having holes through which atoms or ions - Akine and coworkers demonstrated the idea with Cs[+] ions - can enter. Fig.1 Initially closed molecular cage (left). Disulfide bonds can be broken via reactions with thiolate anions, resulting in the formation of apertures (right). Front cover of Chem. Eur. J. 10.1002/chem.201805359 showing the research by Shigehisa Akine et al. that is published in this issue.